"I remember just holding his featherweight frame in my arms." Adm. Stockdale’s legacy goes beyond a few sentences spoken in a debate. Over the course of his Naval career, he earned 26 combat awards including two Distinguished Flying Crosses, three Distinguished Service Medals, two Purple Hearts, four Silver Stars, and in 1976 President Gerald Ford presented him with our nation’s highest military honor: the Medal of Honor. Below: Listen to an excerpt from a February 1973 conversation between James and Sybil, speaking to each other on the phone for the first time in seven and a half years. 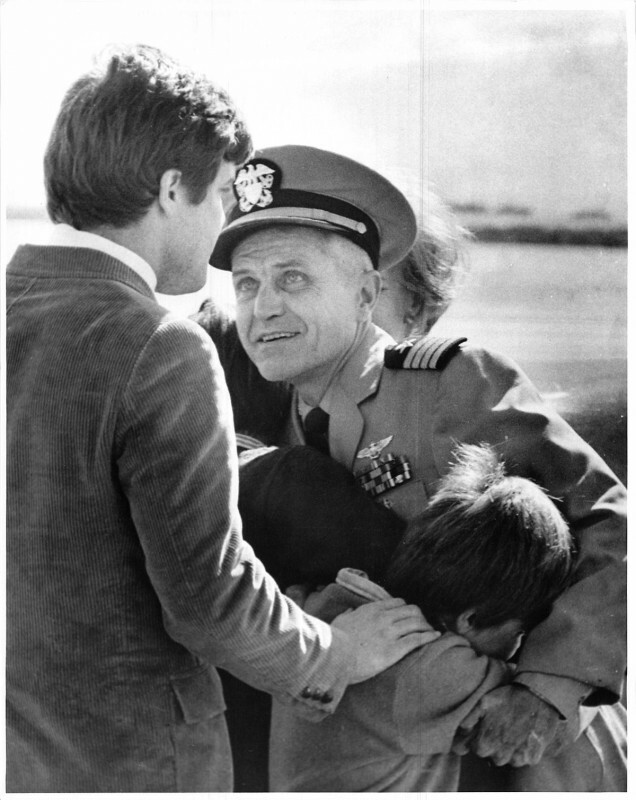 Recorded by their son Stanford, James was at Clark Air Base in the Philippines at the time and would days later be reunited with his family. 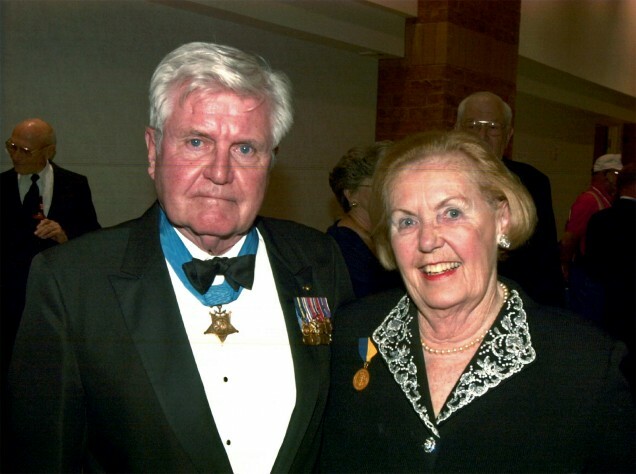 In 1979, Sybil was awarded the U.S. Navy Department’s Distinguished Public Service Award, presented to civilians for specific courageous or heroic acts. 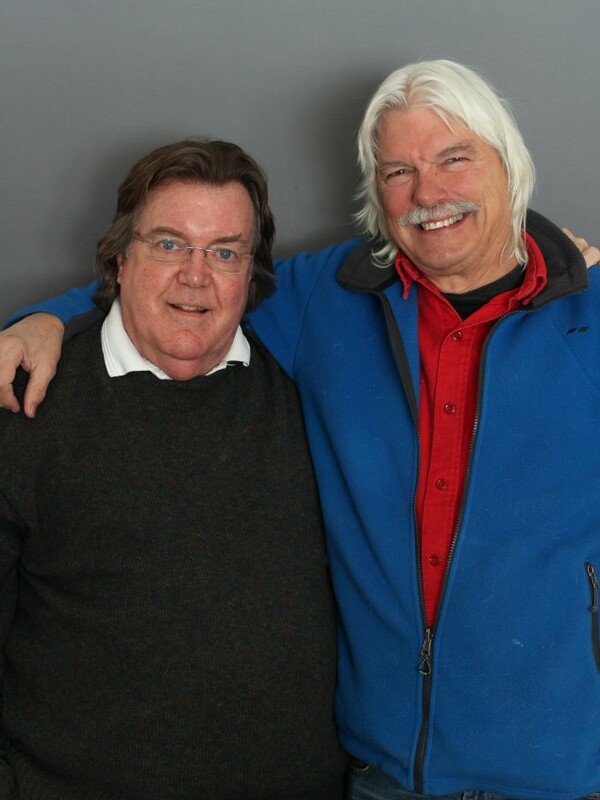 Their son, Jim, a teenager at the time of his father’s capture, came to StoryCorps with his friend, Jasey Schnaars (pictured at left). Jim talked about his mother’s strength as they waited for his father’s return home. Originally aired May 27, 2016, on NPR’s Morning Edition. JS: At one point while dad was gone, mom decided that we would not take any family pictures. She just said it one night at supper and we nodded knowingly as if that made sense. And she decided that she would buy no new clothes until dad came home. There was also a point at which she decided that we should always have a small bowl of rice for supper and that’s all, to sort of share dad’s meager existence. These sound like strange — they are, they’re, they’re emotional kinds of things that really indicated how desperate we were to do something, you know? How we might live our lives in waiting. I, I at one point visited a counselor, probably five years in. And the one piece of advice I remember was, “You may be better off just considering your father dead and gone.” Which, at the time, made pretty good sense to me. You know? After years and years of living with it. The day that dad came home we had been forewarned about dad’s injuries. But standing there on the tarmac, when he came down the a…came down the steps, I remember just holding his featherweight frame in my arms. We were just sort of stumbling over our love for one another. And I remember the third night he was actually at home he wanted to go and call the, ah, wife of one of the men who had died in prison. And, ah, we had about one of those to do a night for a couple of weeks. He felt it was his obligation to report what he knew about the nobility of men who had suffered greatly and had died of injury or infection or, in a couple of cases, just a broken heart as he described it. And we realized how close we had come. And, uh, we maintained a fierce, loving allegiance to one another through to the very end.